Knoxville’s budding Rhythm N’ Blooms Festival has been steadily growing over the past few years, and, now in their ninth year, has become a spring time staple in venues and at the outdoor stages scattered throughout the city’s Old Town. 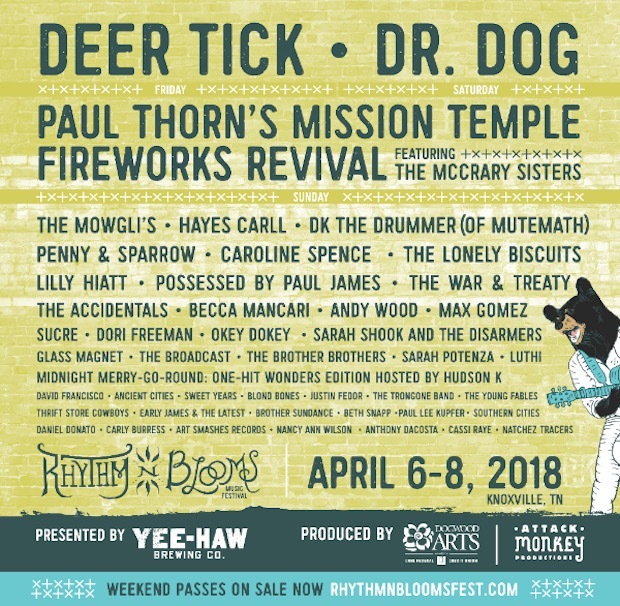 The event’s lineup has been impressively growing too, with the addition of larger touring acts over the past few years, and 2018 is no different with headliners Dr. Dog, Deer Tick, and Paul Thorn’s Mission Temple Fireworks Revival (ft. The McCrary Sisters) helming the end of night honors. Of course, there are plenty of other exciting acts, including a huge number of Nashville based musicians performing, and you can check out the full lineup poster below. Three day general admission tickets are still avialable for $70, and a limited number of VIP ticket options remain as well. Single day tickets will be available in March. You can snag those tickets over at the Rhythm N’ Blooms site.